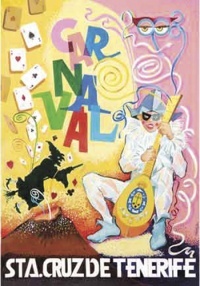 The 2008 Santa Cruz de Tenerife carnival poster has been created by the Canary Islands painter Juan Galarza, the poster is themed on magic, the theme of the annual carnival, which runs from 16 January to 10 February. The poster is reminiscent of the ones produced in the 60s and 70s and features some poker cards and a witch flying over the Teide, to celebrate its UNESCO World Heritage status. 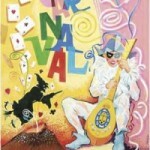 Placed in the centre is a classic harlequin figure playing a large mandolin featuring the coat of arms of the city of Santa Cruz de Tenerife, a tribute to the first Tenerife carnival poster also designed by Galarza in 1962. This year’s celebrations are much earlier than usual and kick off on 16 January with the comparsas, murgas, rondallas and musical group contests. Friday 1st February sees the carnival hitting the streets culminating in the Grand Final Procession or Gran Coso Apoteosis on Tuesday 5 February. The Burial of the Sardine, which closes the festivities for another year, takes place on Wednesday 6 February but revellers still have the chance to dance the last dance on the streets at the weekend.